Ok, a little clarification on Atlatl CG. There are discounts available with a yearly/ senior and disabled resident of NV card. There are about 6-8 sites that are fairly level, including the paved, handicap sites.... if you are fortunate enough to get one. We have a 40' DP, and tried 3-4 sites before we got one where we could level, with our nose about 3' off the ground. You can find very weak Vz cell if you walk around enough, and we able to get wifi with our Vz jetpack on a booster. No AT&T service anywhere we could find. Good water pressure and flawless 50 amp. Unrestricted rooftop DTV. Sites are huge. Easy big rig access in CG and dump station. Noise travels alot here, so it is not a quiet, peaceful CG. We will return, not not in the same site. 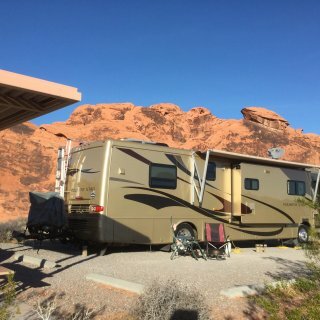 We camped at Valley of Fire State Park in a Motorhome. Close to Lake Meade. About 45 minutes to North Las Vegas. Park wifi worked a little. Unrestricted rooftop DTV, big rig friendly. No cell phone service issues, but...I think this place is getting a little too big for it's britches. 43 a night is a little extreme. What used to be empty lots surrounding the park, are now an apartment complex overlooking the RV park, and a casino going up across the street. The office staff was very unfriendly. It is still probably the safest place to stay in the area still, but there are full time residents everywhere now, when in the past, they had their own area of the park. This is not the type of park we like to stay in, and will not return. 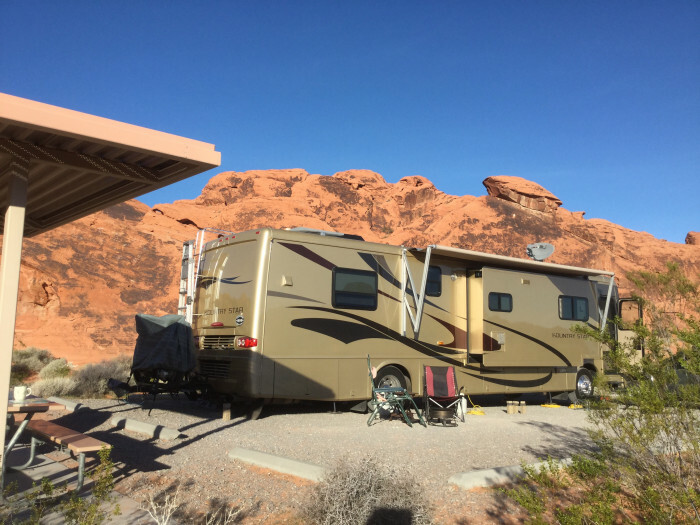 We camped at Sparks Marina RV Park in a Motorhome. Very disappointed in the new owners rate increase. From 25 to 35 is a little of a rediculous price gouging jump. We used to stay here passing through to recharge, but this will be our last time. Apparently security is in charge of escorting people to the casino. A security guard drove through to pick up our neighbors at an extremely high rate of speed, and almost ran over a lady walking her dog. Not sure if she reported it or not. There was quite a bit of trash, and cigarette butts laying around, and the office staff was not nearly as polite as they used to be. We will not return We camped at RV Park at Rolling Hills Casino in a Motorhome. Easy big rig access and all sites appear to be rooftop satellite friendly. Most of the sites are quite large, with plenty of extra parking room. Gorgeous lake views. All utilities worked well. Front office staff friendly. Just an FYI for everyone, the will give a 10% discount for AAA or Access Passes. Not sure about Senior passes though. The laundry is inexpensive... $1 wash and .50 cent dry, but they only have 6 washing machines, and 2 are out of order. Verizon cell, Verizon Mifi and AT&T cell all work fine here. We camped at Wahweap RV and Campground in a Motorhome. This park is not big rig friendly. We only went here because it was the middle of the Senior Games, and no other rv park in a 50 mile radius has a site available. First... It is cash only so be prepared. Second, it is rv jenga. Rigs in the middle had their slides overlapping eachother. Have never seen a park this tight. We had a back in, and our nose was 2-3 feet in the middle of the road, and could only deploy 2 out of three slides. No wifi. 50amp power worked well, and it was full hook ups, which is all we needed after dry camping for a week prior. No showers/ clubhouse/ laundry facilities on site. Rooftop DTV would have worked, but didn't put up our dish, as it was only a 2 day stop to recharge and do some laundry. We will not return. We camped at Hillside Palms RV & Mobile Home Park in a Motorhome. Close to major shopping. Zion is a very pretty, easy drive away. Wonderful City RV park. Has pull thru sites, head in sites, and back in sites. Super spacious with extra in site parking for tow vehicle or toad. Nice grass area, bbq, and picnic table. Rooftop satellite friendly. Plenty of room to open slides. Great water pressure. Make sure you have a regulator before you hook up water here. Our neighbors hose burst. 50amp worked flawlessly. Little bit of road noise, and a tad bit of train noise during the day, but super quiet at night. Walk to the river. Some sites had asphalt. Ours was a combo of dirt and rock. Fairly level sites too! Easy navigation for big rigs. We will definitely return! We camped at Heyburn Riverside RV Park in a Motorhome. First off, the camp hosts were quite nice. This park has been purchased by a new owner recently and there are alot of changes being made. They are adding cabins, which we were right next to, so it was very noisy Mon thru Saturday. Our site was a pull thru that was pretty unlevel. The entire park is dirt, with grass in between sites, so it was very muddy. We were able to get rooftop DTV, and Vz cell, AT&T cell, and Vz Mifi worked well. We were one of maybe 3-5 people in the entire park, but the lady who was cleaning the cabins and her young daughter constantly walked through our site, even though there were empty spots on either side of us. Hopefully the owner will lay some gravel down to soak up the mud, and get the spots leveled out a bit. The newer sites being built behind the cabins will be the best in the park when they are done, maybe next year. Not sure if we will return. We camped at Teton Valley RV Park in a Motorhome. This park is at the West base of the Teton Pass to get to Jackson and the Grand Tetons. All larger retailers are in Jackson. Wonderful park off 84. Satellite friendly, all utilities worked well. Large sites. Vz wifi, Vz cell, and AT&T cell worked fine. This park has a pool, sauna, spa, great book exchange, clean laundry room, and excellent camp hosts and front office staff. Quite a few seasonal and full time residents, but they keep their spots nice and clean, and are mostly around the perimeter of the park. Some road noise, but quiet at night. We will definitely return when passing through the area. We camped at Ambassador RV Resort in a Motorhome. This is by far, the nicest TT park we have been to. The sites are absolutely huge! Easy navigation with big rig, and we by luck of the draw, picked a site where we got rooftop DTV. AT& T, Vz cell, and Vz mifi worked well. Front office staff a little gruff, but we were here to check out the area and go kayaking, not to make friends. Everyone complaining about the speed bumps, guess you were speeding, cause they didn't bother us at all. And those speed bumps help keep down the dust. Only complaint, no sewer sites, so had to use showers at CG. It was pretty darn cold, and the water was nothing more than luke warm. We made friends with several deer that visited us daily, and a ton of squirrels and chipmunks. Tiny bit of roadnoise, but very quiet at night. We will definitely return. We camped at Bend-Sunriver RV Campground - Thousand Trails in a Motorhome. Close to Sun River and Bend. There is a wonderful bike path starting in Sun River that takes you all the way to Lava Lands. About 20 minutes into Bend. Adjacent to the Scenic Byway. Another wonderful Oregon State Park. Terrific location about 1/2 between Reedsport and Coos Bay. 50 amp service worked flawlessly, and water pressure was pretty decent. The State Park employees were super helpful, and kind. Vz Mifi, Vz, and AT&T cell service worked quite nicely. Adjacent to Eel Lake. No rooftop satellite due to trees, but, you are in the middle of the forest. Saw a couple sites where people had portable dishes out. It was for the most part, nice a quiet. Depending what spot you're in, could be some road noise from 101. Pretty easy maneuvering our 40' DP through the park. We will definitely return in the off season again. We camped at William M. Tugman State Park in a Motorhome. Great boating and fishing in Eel Lake, and some very nice hiking trails around the lake. Propane is cheapest at Chevron in Reedsport. There is also a small Safeway there. Great base camp area to explore Coos Bay, and nice easy drive to Siltcoos river/ Lake for kayaking. Nice clean park with easy big rig access. This is our 3rd stay on our way North for the Summers. This year, we hit it at a perfect time, in between snowbird migration, and half the park was empty. 50amp power, Vz mifi, Vz Cell, and AT&T cell works well here. Two things I would like to see improved at this park... A picnic table would be nice, and the spots could use some leveling. We had to dump and level, which, when you plan on leaving very early the next morning, is disrespectful to our neighbors. But hey, it's part of the lifestyle. Still, a safe, quiet, inexpensive place to stop for the night. We camped at RV Park at Rolling Hills Casino in a Motorhome. Very easy big rig access from either 99 or 5. I called about 2:15pm, and the nice gentleman who answered the phone assured me they had a pull thru spot available. He told me he would be there till 7pm, and gave me instructions if we arrived later than that. Super level, quiet, clean, pull thru site. Not a destination area, but a safe, inexpensive place to rest for a night. Vz mifi, Vz cell phone, and AT&T cell worked fine. 50amp worked well. We will definitely return when heading through. We camped at Bear Mountain RV Resort in a Motorhome. This " rv park " is what we call interesting. The CG host was quite helpful and very nice. We had a full hookup spot. All utilities worked well, and we were able to use our rooftop DTV dish without issues. Pros... San Diego area, full hook ups for $26 a night. Close to Sea World and shopping. Cons... If you have a big rig, you will be VERY limited on space. Cannot use your awning, and you have NO patio area unless you have a little coach. There were alot of fulltimers here, who appeared to be pretty messy. A lot of trash/ cigarette butts/ broken sewer hoses and run down rv's here. There is quite bit of road noise too. It did the job, and gave us an safe place to park while visiting the area. We will not return. We camped at Chula Vista Elks Lodge #2011 (Members Only) in a Motorhome. This a beautiful SKP Park. Gate code entry, and all utilities worked well. Down side was not being able to use washer/ dryer in our coach, but laundry was $1.50 for super load, and . 25c every 15 min to dry. Very quiet, AT&T cell signal a little weak, but Vz cell worked well. This is one of the first parks we have been to that their wifi actually worked, and worked quite nicely. Wooded sites. Alot of mosquitoes at sun down. Lots and lots of yellow pollen from trees. We managed to get roof top DTV some how. Overall, an excellent park! We camped at Park of the Sierras - Escapees Park (members only) in a Motorhome. About an hour to Yosemite entrance. There is a Vons in Oakhurst, about 15 up the road. The unleaded gas there was more expensive than in Coarsegold, and made our truck ( unleaded ) ping. Propane is offered in the park on Monday and Wednesday am only for cylinders. $2.08 a gallon, which is a bargain in the area.